January: Joined Business Link Wakefield & District for fixed-term project to help co-ordinate business support services and to set up a quarterly networking forum – reviving the name of a dormant Wakefield Training & Enterprise Council project: the Business Growth Forum. The project was to be aimed at manufacturing and engineering businesses. My title was ‘Business Support Networker’. Continued to facilitate small number of outstanding IBS contracts by working weekends and leave (with knowledge of employer) as sole trader ‘Keith E Rice’. Commentary: After the trauma around the collapse of Rice & Rice, throwing my lot in with the Business Link was a huge relief. Tony Brown asked me to complete a small handful of unfinished projects. They were all completed by the Summer and that effectively brought my relationship with IBS to an end. January: Undertook first consultancy work under my own name, assisting the Woodlands MS Respite Care Centre (York) with updating their business plan and progressing their Investors in People project. 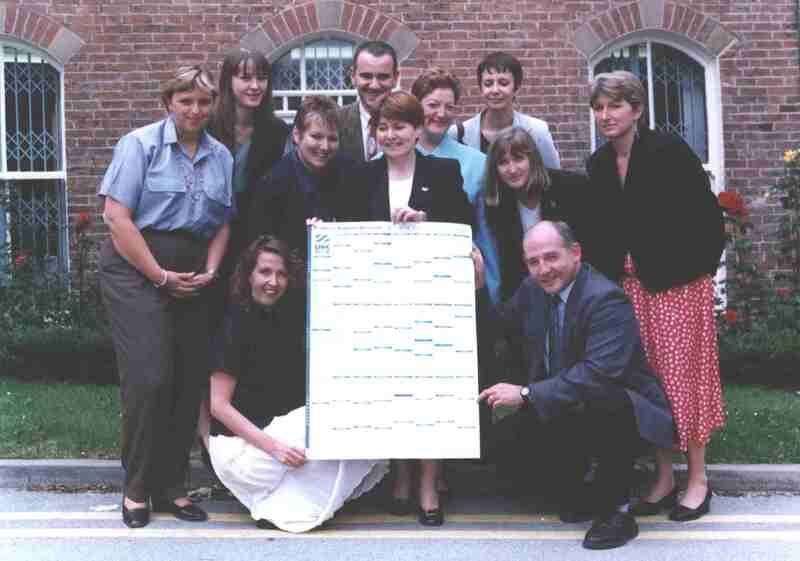 Commentary: Woodlands had been part of the first IBS/North Yorkshire TEC IiP Consortium in 1995. After a gap of more than a year, they decided they needed some farther assistance – and they wanted me to provide it. Tony Brown had backed off from IiP, preferring the more straight-forward work of selling Kalamazoo-type care planning templates into care homes. Consequently, there was no conflict of interest in reviving the relationship with Woodlands under my own name. March: First meeting of the Business Growth Forum. Commentary: The Calendar was intended to promote these events to Wakefield District businesses which were regarded as rather backward in that there seemed to be a marked reluctance to take advantage of all the part-funded programmes and schemes on offer from the various agencies. The Calendar was also a way of trying to get the agencies to co-operate more and compete with each other less. (I frequently found myself in the role of a diplomat negotiating around their rivalries!) The Calendar became popular with both businesses and the agencies and went, inside 3 editions, from a set of stapled photocopies to an A1-size glossy. Eventually we also had a web version of the Calendar which was updated on a weekly basis. April: Carried out Staff Appraisal Training for IBS client Oakleigh Nursing Home (Bradford) as part of their IiP project. June: Work with IBS client The Ingleborough Nursing Home (Ingleton, Lancs) to achieve IiP commended by Assessors. October: Became the Business Link representative on the Management Development Forum, a struggling initiative led by Wakefield College to encourage businesses to invest more in training programmes being offered via the local business support agencies. November: The Business Growth Forum expanded and became a monthly event – following the highly-successful conference I was heavily involved in organising: ‘Preparing for the 21st Century: Supply Chain Management’. Commentary: In all honesty, after its first 3 meetings, the Business Growth Forum, like so many other Business Link and TEC events, was struggling to attract viable attendance figures. The success of the conference changed all that and set us on the road to something different altogether. Much of the credit for the success of the conference can be attributed to Phil McMahon, whose organisation, (Innovative Supply Chains & Networks), was able to show how small businesses could access supply chain opportunities – and the kind of changes they would need to make to access those chains. How the Business Growth Forum developed into a ‘world-beating’ entity is told more fully in the 21st Century Group tribute page.